Copyright © 2007 by Kathleen Kemsley, submitted to a travel writing contest in 2008. When the opportunity arose, I seized the chance to spend three weeks traveling in the highlands of Peru. It was not the easiest choice of destinations. Five years earlier, I had been diagnosed with a nervous disorder that affected my legs, causing numbness, tingling, and weakness. In the weeks leading up to the departure, I practiced hiking up and down the muddy banks of the Rio Grande River in my hometown. I wasn’t certain how my legs would work in Peru, but I was willing to try. I was not the only one of our party to struggle with disability. My husband, Brian, had chronic obstructive pulmonary disease; our friend Jim suffered from post traumatic stress, courtesy of a tour in Vietnam. In the end we all went anyway, for we would never get any younger or healthier. But alas, a serious problem arose when we reached the Andean highlands: Brian was unable to catch his breath. Aspirin didn’t help, nor did coca tea. What had been diagnosed as mild emphysema at sea level turned into agonal breathing at two miles high. Cusco’s exotic ambiance could not compete with Brian’s urgent need for oxygen. He had to descend immediately. Knowing how badly I wanted to experience the Andes, Brian urged me to stay in Cusco with Jim for the rest of the week. With great relief – and more than a little guilt – I put Brian on a flight to Lima. Jim, a long-time friend and former neighbor, had previously accompanied us on trips to Toronto, San Francisco, and down the Alaska Highway. Generally, left to his own devices, he was more likely to look for a place to string his hammock than he was to explore. Still, hoping for the best, I hopped a rickety bus with him to attend the Pisac market. 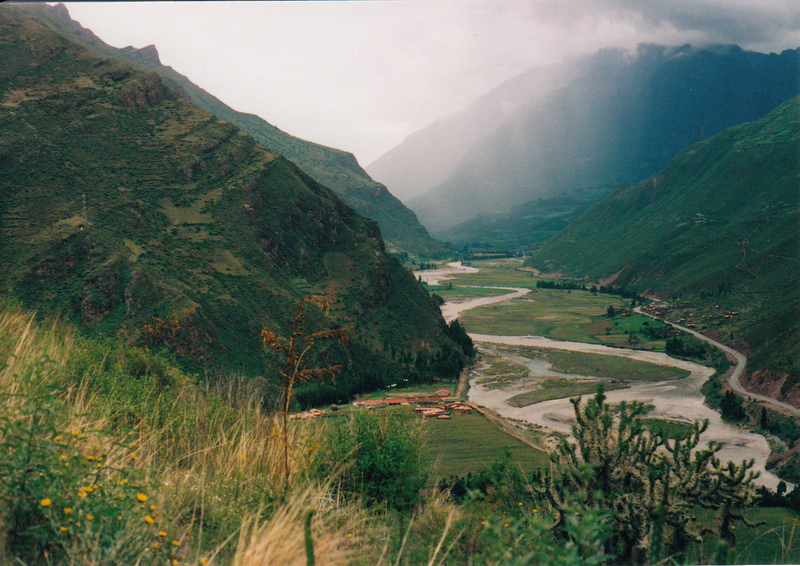 Thirty miles or so distant from Cusco, Pisac was, six days a week, the picture of peaceful serenity in the Sacred Valley. 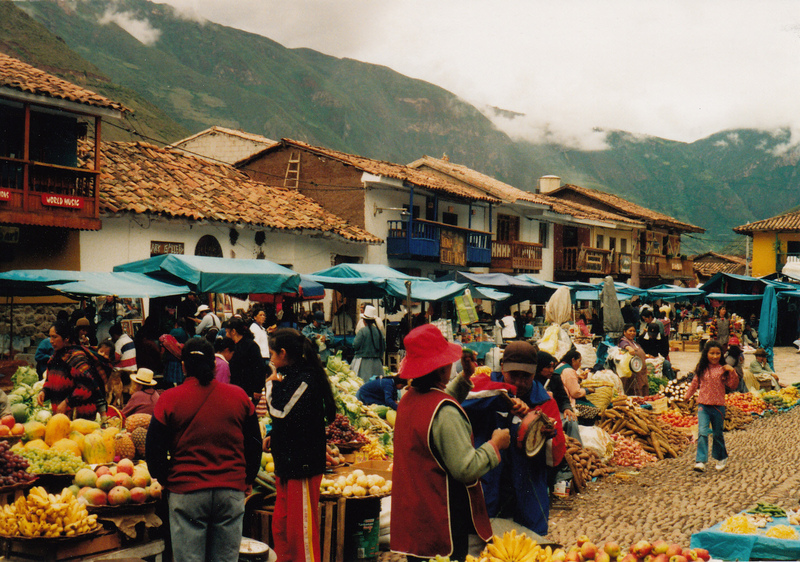 Sundays, however, Pisac hosted a market attended by both villagers and tourists from miles around. This particular Sunday, the last before Lent, offered a special bonus: a Carnaval celebration. In the Andes highlands, the holiday was welcomed with parades, pageants, and colorful costumes. Energetic dancers, accompanied by pan flute and drum, performed on a raised stage in the town square. Bands of kids ran wild through the audience, throwing buckets of water at each other. The younger kids threw indiscriminately, while the teenage boys slyly aimed their ammunition at the chests of giggling girls. Jim mumbled something about getting horizontal and disappeared into the crowd. Restless, I walked up to the Artisans Market. Booth after booth was piled with stuff: jewelry, leather purses, flutes, tee shirts, wooden toys, sweaters, stuffed animals, paintings, key chains, pottery. The sheer number of items for sale was overwhelming. At the end of one of the vendor aisles, my eye was drawn to some verdant green terraces that sloped upward toward the sky. I followed a muddy path to a trailhead. Ruinas Pisac, the sign beckoned. At a stone booth just past the sign, I asked the gatekeeper in my halting Spanish how far away lay the ruins. “Una hora, cinco kilometres,” he answered. With a hand he showed me the slope. “Straight up,” I translated, tilting my head back. Could I dare even attempt a hike like this? Leading up to this trip-of-a-lifetime, I had faithfully practiced walking. Covering two miles each day, never blowing it off, had thus far managed to keep me moving. But that was on flat ground. This was something else. This was a stairway to heaven worthy of Led Zeppelin. From the time I read Secret of the Andes as a child, I had harbored a dream to someday walk these highlands. 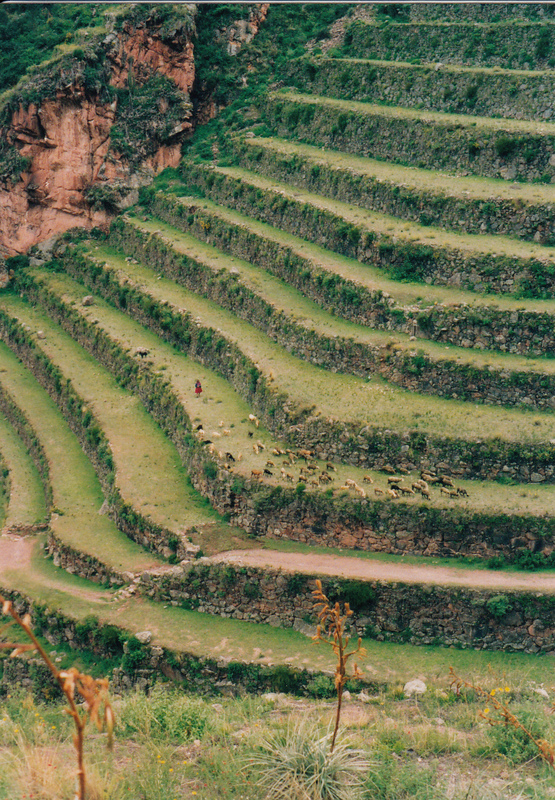 Now I gazed at the terraced hillside, hopelessly steep, and decided to follow my heart’s desire in the Sacred Valley and climb. There was something calming in the simple labor of stepping up each switchback on the mountain. The past few days I had spent frantic with worry about Brian’s breathing problems, and selfishly fearful that I would miss the Andes experience. More than anything in Peru, I wanted to do this: I wanted to climb like an Inca. A solo hike up the side of a Peruvian mountain might have been a modest goal for a young, healthy traveler. But for me, this trek was the realization of a lifelong dream. A curtain of rain and a shard of sunlight moved past me as I ascended. There was no need to turn and check whether anyone was keeping up with me. I breathed deeply. My legs trembled and wobbled like they were made of rubber. Prickly tingles along my thighs reminded me that I wasn’t used to this kind of a vertical stroll. A quarter of the way up, I suddenly remembered Jim. I had not told him where I was going. But I couldn’t bring myself to forfeit the altitude I had already gained. Besides, I told myself, he was most likely stretched out on a piece of cardboard behind someone’s craft booth, snoring away. He probably hadn’t even missed me. For one afternoon, nobody needed me. I was completely free. I kept climbing, up and up. Flowers of gold and pale lavender bloomed along the narrow trail. A tiny waterfall tumbled over granite. Wisps of flute music floated up on the wind from the Carnaval dances. Beyond a steep gully, a shepherdess urged her flock of llamas across an impossibly green terrace that had been constructed in Roman times. Essential Peru spread before me like a diorama. The spirit of the Incas accompanied my every step. The final half mile nearly defeated me. 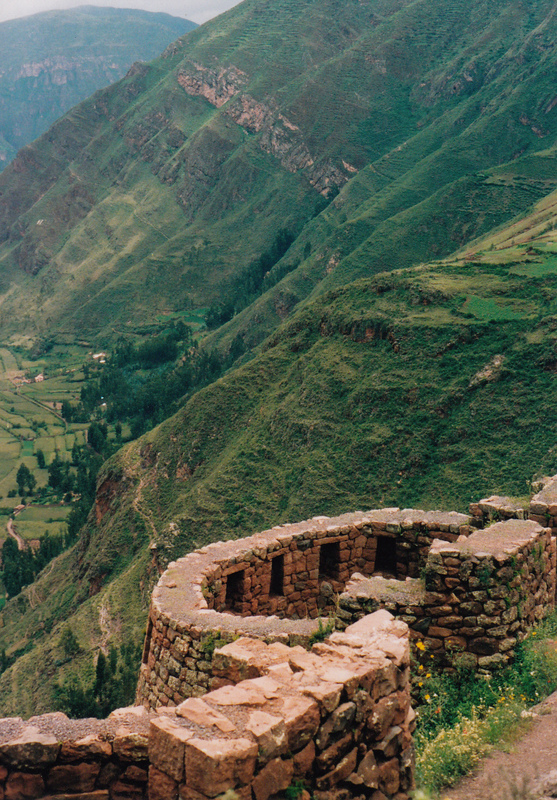 Struggling up the last few steps, I cleared the top of the mountain and beheld the Pisac Ruins. Intriguing the ancient rock structures were. Stunning. Mysterious. For an hour I wandered, photographing a canal here and a stone wall there. The air at the top of the mountain smelled pungent and moist like freshly turned soil. A handful of people passed me on the trail; I wondered idly where they came from. Then I rounded a citadel and – just like that Far Side cartoon – spied a parking lot full of busses and taxis. “There’s a road to get up here!” My laughter sounded like a screech, borne of both exhaustion and exhilaration. Tourists ambling up from the parking lot detoured wide around me. I strode past them, gulping the last water from my bottle and singing El Condór Pasa. Righteous I felt for having reached the ruin in the same way the Incas reached it. But I was too tired to walk back down the mountain, too. Fifteen minutes and a five dollar taxi ride later, I was again in the Pisac plaza, reunited with Jim.